This is true. You don’t have to. You can just as easily get the same knowledge through going to conferences, reading writing books, following writers’ blogs, and, most of all, writing. All of those things are excellent things to do, and maybe for you as a writer, it’s the path you need to take. But don’t discount going to college for writing too quickly. It’s the path I decided to take, and I don’t regret it. As a teen, I knew I wanted to pursue writing, and I knew I wanted to go to college. Since I didn’t have the money to go to college and attend writer’s conferences, I chose college. 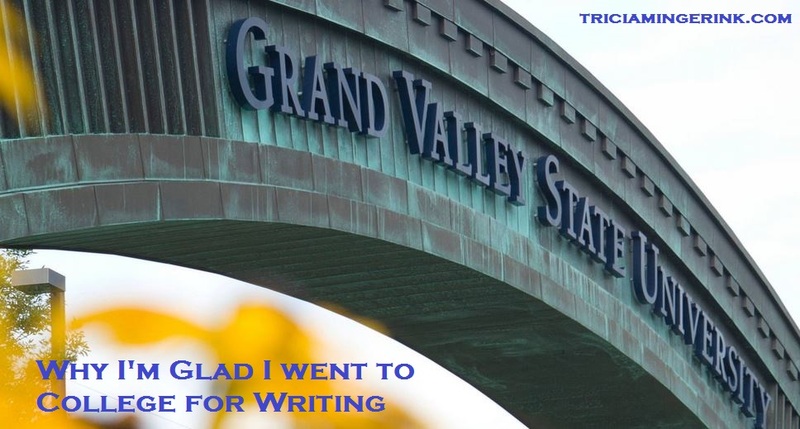 I was blessed that my local university (Grand Valley State University) has an actual writing department and B.A. program that is separate from the English department. Only about 30 colleges in the United States have a program like it. All of the professors have to be actively writing and either publishing or pursuing publication. The classes are writing classes and workshops, not English classes. The difference? An English class looks at a metaphor and interprets what it means. A Writing class looks at a metaphor and asks what it does, how it works, and how to use it. The Writing Center, where writing students help other students work on their papers and writing due for classes, is so well-known that Harvard (yes, Harvard!) patterned their writing center after it. 1. I learned how to write when I didn’t feel like it. I’ve always been motivated by grades, so when I had a story due and I didn’t feel like writing, the thought of that failing grade pushed me to write anyway. Once I built up that discipline, it was easier to keep it up after college. 2. I learned how to take a critique. There’s nothing like offering up a story to thirty people plus your professor, then having to sit there silently while all 31 of them pick your story apart in front of you. It’s pure torture the first couple of times, but usually everyone is respectful and only gives constructive criticism. 3. I learned how to give a critique. Once again, grades are a good motivation. At GVSU, we were graded on the quality of our critique. I learned how to read another student’s work with an eye to helping them improve. 4. I learned how to distance myself from my writing. The classes, especially the upper level writing classes, could be intense. I didn’t always get a lot of time between writing a story, having it critiqued, and editing to turn in. I didn’t have the luxury to set it aside until I was ready to tear it apart. I had to make myself ready and dive in. 5. I learned how to write tight. I’m still working on this, but I’m much better than I used to be. Since we had limited amount of time, we learned and wrote short stories in our writing classes. It was tough learning to tell a story in such a short form, but I learned to cut a lot of unnecessary stuff to give me more room for plot and character. 6. I learned to develop characters. Anyone who has read my work knows I struggle with this. It is still a struggle, but I had almost no character development before going to college. Since GVSU teaches literary writing, character is king. It pushed me to think about characters in a way I hadn’t before. 7. I learned how to be a part of a writing community. There is something special about walking into a room and knowing everyone in that room gets writing. I’m sure a conference is even more amazing, but I liked starting small. Like I said, there are other ways to get all of these things. But for me, this is the way I was pushed. I needed the accountability and discipline that college demands. A writing partner might let lack of discipline slide, but a college professor doesn’t. And I got a degree that was worthwhile. A Writing degree is surprisingly versatile. A variety of businesses look for good writers, not just publishing companies. So what is your path? Do you think going to college for writing is for you or is something else? Just curious…Did you get to pick what you wanted to write about for your stories in college, or did your professor tell you what to write? Half and half. In college, they emphasize literary fiction (high on character development, low on plot). Since I’m a plot heavy sort of writer, I struggled somewhat with this, though it was good in the sense that it helped me focus more on character development than I would have on my own. For the most part, the professors would let us pick what we wanted to write about, though mostly it would have to fit into a certain short story length. But I am glad to know there are writing programs like that available, in case I ever do decide to go to one. There are other ways to get a similar experience without going to college for writing. Reading a lot of writing books and pushing yourself to get better. Going to writing conferences. Taking a few online writing courses. Stuff like that. Not everyone’s path to writing is the same. Oh, I know. I’ve been reading books on writing, and I have taken a few online writing courses. I would love to attend writing conferences, but I don’t have money for those yet. Do you have any writing books and/or courses you would recommend to a beginning writer?